Congratulations Pinterest on 100 Million Pinners! Pinterest has just announced that the image-sharing website now has over 100 million users! Congratulations, Pinterest! When I first discovered Pinterest in the summer of 2012, it took very little time for me to realize what a helpful and fun website it was. Pinterest allowed me to organize my web bookmarks in a logical, visual, easily-found way. Over time, Pinterest added more great features, like the ability to search for pins and boards that shared a topic of interest. As I got hooked on pinning, I heard stories of people losing boards or whole accounts to hackers, or accidentally deleting them. Not wanting to lose all the wonderful ideas and information I had collected, I had the idea to create Pin4Ever to save a backup copy of all the pins, likes and boards from any Pinterest account. The Pin4Ever app and website was launched in September 2012. 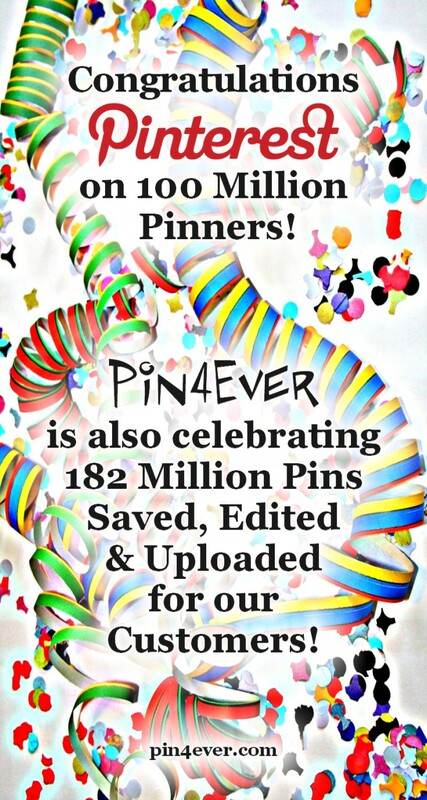 Just like Pinterest, Pin4Ever has grown over the years. As of September 2015, three years after its debut, Pin4Ever has saved, edited or uploaded over 182 million pins for our customers. Pin4Ever has added many unique Pinterest tools, besides the original account backups, and some of them were created based on suggestions from our customers. We at Pin4Ever would like to thank Pinterest for creating such an awesome website and service, which led to the launching and success of our own business creating Pinterest tools. And we’d especially like to thank Pin4Ever’s customers for using our free and paid Pinterest tools, and enthusiastically supporting our business. Important Pin4Ever Update! Your Action Required! Pinterest Down? Pin4Ever Backups to the Rescue! Christina on Pinterest’s Next New Feature?